Following on from iPhone Annoyances I decided to investigate the cause of the release jumping that I'm experiencing when scrubbing. I was puzzled at what causes the jumping so I wrote a little app "TouchTest" which tests the touch actions in IOS. My plan is to attempt to replicate the coordinate changes that occur when I release a touch. Cocoa Touch is the application framework used in writing IOS applications. It is part of Apple's SDK. Cocoa Touch follows the concept of Model-View-Controller (MVC) which you should be familiar with as it's the weapon of choice in most UI focused frameworks. Ruby on Rails, Catalyst, ASP.NET MVC, Struts / Spring, Django to name a few. The nuts and bolts of the of the application are in my custom UIView. Even if you are not familiar with Objective-C I think the code is quite easy to read & understand. The app displays the X & Y coordinates of the previous and current touches. To accomplish this I define 2 UILabels (previousTouchLabel & currentTouchLabel) for display purposes and 2 CGPoint data structures (previousTouch & currentTouch) which provides X & Y floating point accessors. drawRect: is the method that is called every time [self setNeedsDisplay] is called. It simply draws a small circle on the display at the coordinates of the current touch. It also messages 'updateLabels'. updateLabels: does exactly that. Updates the text attributes of both previousTouchLabel & currentTouchLabel. The updated text is immediately displayed on screen. The real work is being done in the "touches*:withEvent:" methods that are inherited from the UIResponder Class. By overriding these methods I can intercept all beginning, moving and ending touches. The three touch methods are almost identical. In fact "touchesBegin: withEvent:" & "touchesMoved: withEvent:" are identical. 'touches' contains a collection of up to 5 UITouch objects (one for each finger that touches the screen). I'm only interested in the 1st one ( I'm only going to be touching the display with one finger) so I pop the 1st touch event off the collection and store it in our local variable touch. Next I make previousTouch equal to the current value of currentTouch before updating currentTouch with the coordinates of our touch object. Finally I call 'setNeedDisplay' to redraw the display. 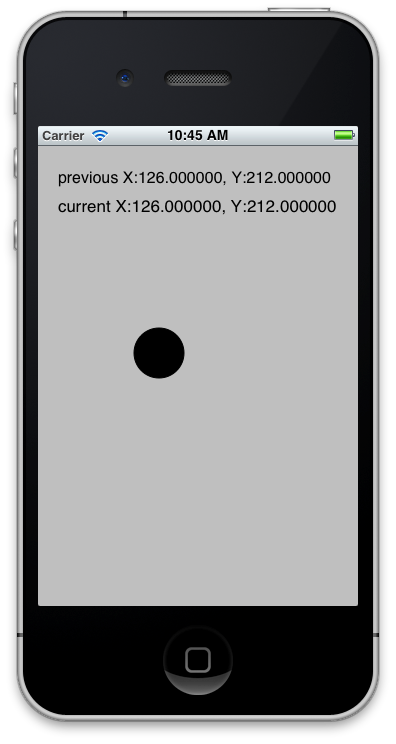 touchesEnd: withEvent: has slightly more code as we also perform a rough calculation to find the difference between the 'previousTouch' and 'currentTouch' points. the resulting output goes to our debug window. XCode comes with a brilliant simulator called 'IOS simulator'. It's a software instance of an iPhone or iPad. Above is TouchTest running on the simulator. 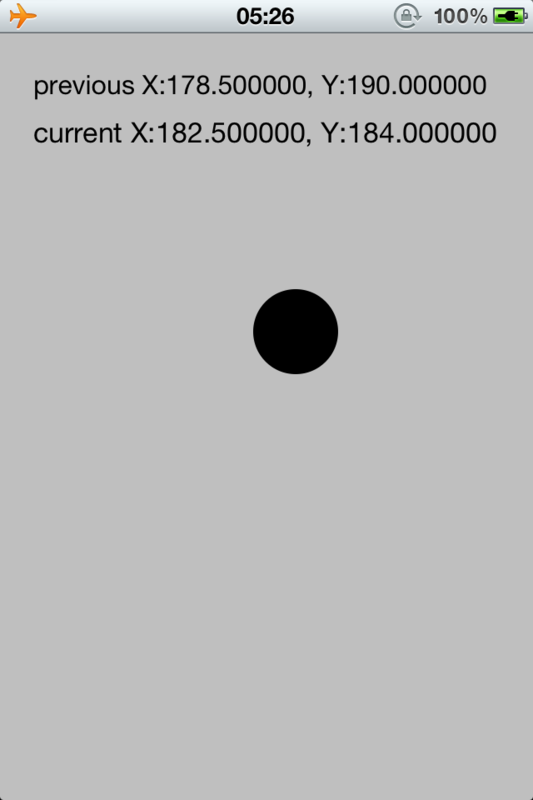 I can move the mouse around the simulated iPhone and click away. I see for the most part the previous & current value remain identical for most clicks. I can get different values if I drag the mouse during a click. The simulator however is not ideal when testing touch events as the mouse is not a fat finger. It's easy to click on a mouse without moving it. When I fire up the code on my iPhone (just as easy as running on the simulator) I can immediately simulate the issue I see when I'm scrubbing in the music app. Even when tapping the screen quickly the majority of my touches previous and current are not equal. WTF! Hmm.. Why are we registering the touch event in the touchesEnd: withEvent: method in any case. There doesn't seem to be a good reason for doing this in most applications? By not registering the touch event in my touchesEnd: withEvent: method I would expect to see the annoying jump stop occuring for the most part. Running the code now and that's exactly what I see. A simple solution! so why isn't Apple doing this. Have I missed something? May 25, 2012 by judioo.